Yes, to answer the first and maybe most obvious question, the name of the series remains Marvel’s Agents of S.H.I.E.L.D, in spite of… well, in spite of what happened in Captain America: The Winter Soldier and subsequent to that on the show itself, at the end of its first season last May. And yes, Agent Coulson is now Director Coulson, and we couldn’t be more proud. If you haven’t seen the movie or the end of last season’s Marvel’s Agents, you’d better get on that right away, and skip the synopsis below. From left to right, that’s B.J. 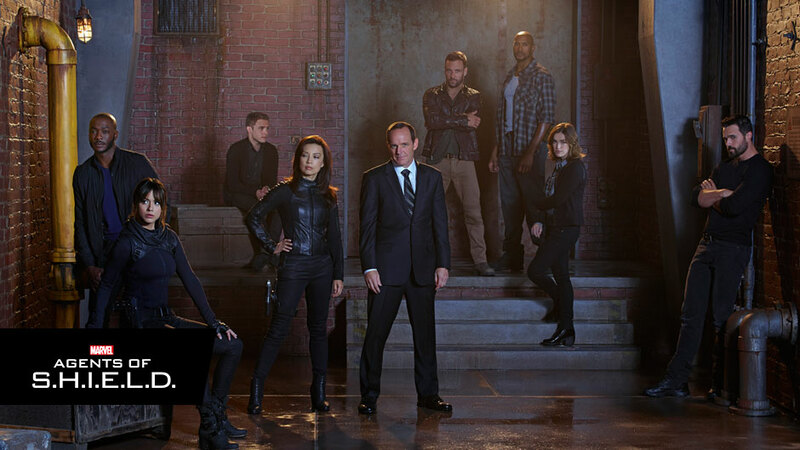 Britt as Agent Antoine Triplett, Chloe Bennet as Agent Skye, Iain De Caestecker as Agent Leo Fitz, Ming-Na Wen as Agent Melinda May, Clark Gregg as Director Phil Coulson, Nick Blood as Lance Hunter, Henry Simmons as Alphonso “Mac” Mackenzie, Elizabeth Henstridge as Agent Jemma Simmons and Brett Dalton as Grant Ward. Marvel’s Agents of S.H.I.E.L.D. stars Clark Gregg as Agent Phil Coulson, Ming-Na Wen as Agent Melinda May, Brett Dalton as Grant Ward, Chloe Bennet as Skye, Iain De Caestecker as Agent Leo Fitz, Elizabeth Henstridge as Agent Jemma Simmons and Nick Blood as Lance Hunter. Marvel’s Agents of S.H.I.E.L.D. was co-created by Joss Whedon, Jed Whedon & Maurissa Tancharoen, who also serve as executive producers along with Jeph Loeb and Jeffrey Bell. Marvel’s Agents of S.H.I.E.L.D. is produced by ABC Studios and Marvel Television, and is broadcast in 720 Progressive (720P), ABC’s selected HDTV format, with 5.1-channel surround sound. Marvel’s Agents of S.H.I.E.L.D. Season 2, starring Clark Gregg, Ming-Na Wen, Brett Dalton, Chloe Bennet, Iain De Caestecker, Elizabeth Henstridge, and Nick Blood, premieres Tuesday, September 23 at 9/8c on ABC.